Solemn form of initiation of the Jewish youth into their ancestral faith. The rite is mentioned officially for the first time in an ordinance issued by the Jewish consistory of the kingdom of Westphalia at Cassel in 1810. There it was made the duty of the rabbi "to prepare the young for confirmation, and personally to conduct the ceremony." At first only boys were confirmed, on the Sabbath of their Bar Miẓwah, and the ceremony was performed at the home or in the schoolroom. In Berlin girls were confirmed for the first time in 1817, in Hamburg in 1818. The rite was at first rigidly excluded from the synagogue, because, like every innovation, it met with violent opposition. Gradually, however, it found more favor; classes were confirmed together, and confirmation became a solemn and impressive celebration at the synagogue. In 1822 the first class of boys and girls was confirmed by Dr. Kley at the Hamburg Temple, and in 1831 Rabbi Samuel Egers, one of the most prominent rabbis of his timeand a man of unquestioned orthodoxy, began to confirm boys and girls regularly at the synagogue of Brunswick. While in the beginning some Sabbath, frequently Sabbath Ḥanukkah or Passover, was selected for confirmation, it became more and more customary, following the example of Egers, to perform the ceremony at the synagogue on Shebu'ot, because this festival is peculiarly adapted for the rite. As it celebrated the occasion when the Israelites on Sinai, of their own free will, declared their intention to accept the obligation of God's Law, so those of every new generation should follow the ancient example and declare their willingness to be faithful to the religion transmitted by the Fathers. Confirmation was introduced in Denmark as early as 1817, in Hamburg 1818, and in Hessen and Saxony in 1835. The Prussian government, which showed itself hostile to the Reform movement, prohibited it as late as 1836, as did Bavaria as late as 1838. It soon made its way, however, into all progressive congregations of Germany. In 1841 it was introduced in France, first in Bordeaux and Marseilles, then in Strasburg and Paris, under the name "initiation religieuse." 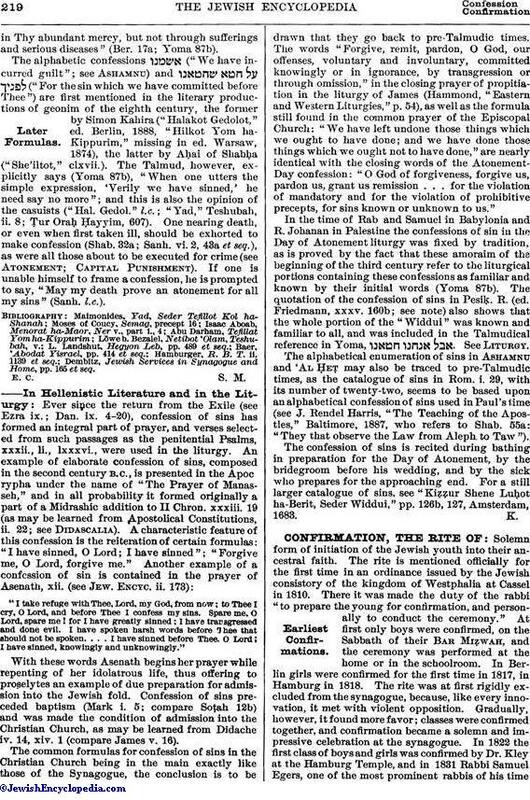 The first Israelitish synod in 1869 at Leipsic adopted a report by Dr. Herxheimer on religious education, the thirteenth section of which contains an elaborate opinion on confirmation, recommending the same to all Jewish congregations. In America the annual confirmation of boys and girls was first resolved upon by the congregation of Temple Emanu-El of New York on Oct. 11, 1847; and the first confirmation at that temple took place on Shebu'ot, 1848. A confirmation had been held two years before at the Anshe Chesed Synagogue of New York. The ceremony has since gained so firm a foothold in America that there is now no progressive Jewish congregation in which the annual confirmation on Shebu'ot is not a regular feature of congregational life and one of the most inspiring ceremonies of the whole year. Grätz ("Gesch." xi. 374) blames Israel Jacobsohn for having introduced, among many other synagogue reforms, the confirmation of boys and girls, which, he says, "has no root in Judaism." In the opinion of reform Jews confirmation, like the organ and other innovations traceable to non-Jewish associations, lends an impressiveness to the initiation of the young into their ancestral religion which the bar miẓwah institution had lost, owing to the unfamiliarity of the children with Hebrew. Besides, there was no provision for a solemn consecration of the Jewish maiden to her religious duties. Confirmation was the first step toward the official recognition of woman as a member of the Synagogue. While many Orthodox leaders object to confirmation on the ground that it has been borrowed from the Protestant Church, where also it is but a recent development and not at all characteristically or typically Christian (see "Confirmation," in Herzog-Hauck, "Real-Encyc. "), or because it contradicts the principle that the Israelite is pledged by the covenant of Sinai by his birth Shebu, 22b), there is nothing in the rite which is not thoroughly in harmony with the spirit of Judaism. It does not mean initiation into the faith, or admission into the Jewish community, but is a solemn declaration of the candidates, after having been sufficiently instructed in their duties as Jews, and being imbued with enthusiasm for their religion, to be resolved to live as Jews and Jewesses. 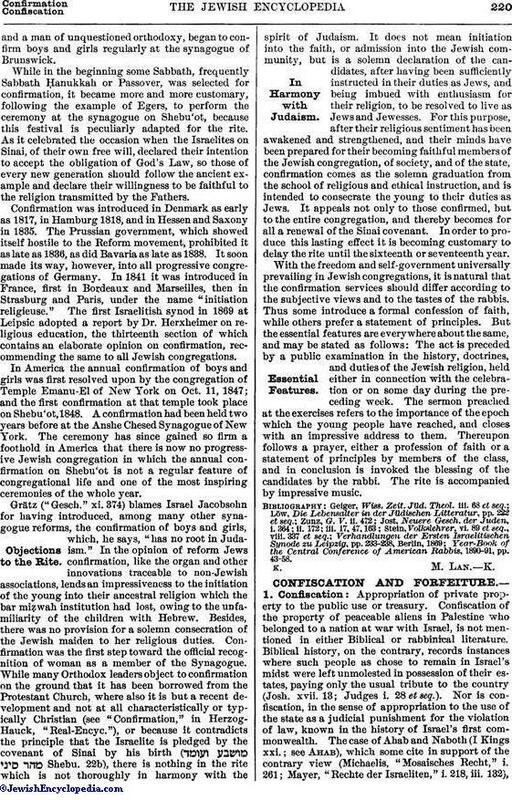 For this purpose, after their religious sentiment has been awakened and strengthened, and their minds have been prepared for their becoming faithful members of the Jewish congregation, of society, and of the state, confirmation comes as the solemn graduation from the school of religious and ethical instruction, and is intended to consecrate the young to their duties as Jews. It appeals not only to those confirmed, but to the entire congregation, and thereby becomes for all a renewal of the Sinai covenant. In order to produce this lasting effect it is becoming customary to delay the rite until the sixteenth or seventeenth year. With the freedom and self-government universally prevailing in Jewish congregations, it is natural that the confirmation services should differ according to the subjective views and to the tastes of the rabbis. Thus some introduce a formal confession of faith, while others prefer a statement of principles. But the essential features are everywhere about the same, and may be stated as follows: The act is preceded by a public examination in the history, doctrines, and duties of the Jewish religion, held either in connection with the celebration or on some day during the preceding week. The sermon preached at the exercises refers to the importance of the epoch which the young people have reached, and closes with an impressive address to them. Thereupon follows a prayer, either a profession of faith or a statement of principles by members of the class, and in conclusion is invoked the blessing of the candidates by the rabbi. The rite is accompanied by impressive music. Year-Book of the Central Conference of American Rabbis, 1890-91, pp. 43-58.